In part 2 of this series, Deepak Thaper follows on from his basics of digital transformation to look at the strategy and journey through transformation in a little more depth. In this video, Deepak uses the quadrant theory to look at how organisations can place themselves in a digital market for long-term success for digital transformation. There are some key parts to digital transformation strategy planning including, goals and objectives, user review, requirements, prioritisation, a milestone plan to keep you on track and many more, that will lead to a more successful digital transformation project. Deepak uses examples to explain each step of the digital transformation planning process to help improve consistency throughout the digital transformation process. This video highlights the importance of consistency and a steady pace when undergoing a digital transformation process. You can watch Part 1 of the series here. Deepak Thaper is an AgilePM, PRINCE2 & PSM Certified project/programme manager (technical) with over 19 years of extensive national & international IT experience into delivery management & development, who is currently managing 2.5 m programme in UK Healthcare sector. 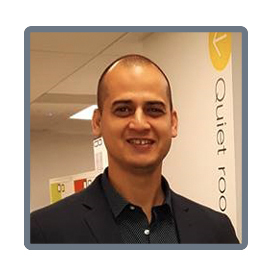 Deepak has multiple years of experience of Account growth, Building client relationship, Bidding for new engagement and Presales activities. While managing sizable projects successfully Deepak had always gone at ground level to provide contribution at technical & functional area as well. Deepak is passionate about running, regularly running marathons, trekking/mountaineering and taking part in various physical challenges.